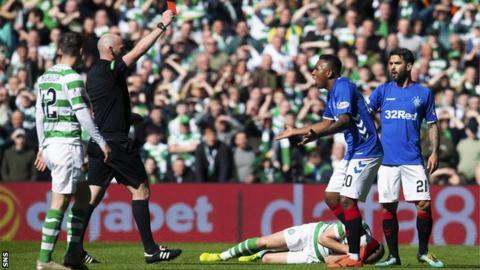 Manager Steven Gerrard says he "can't defend" Alfredo Morelos any more after the Rangers striker was sent off for the fifth time this season during their 2-1 Old Firm defeat by Celtic. Morelos reacted to an off-the-ball flick by Scott Brown, elbowing the Celtic captain in the face. The Colombian has also been red-carded for lashing out at Aberdeen's Scott McKenna and Graeme Shinnie this term. "He'll be punished internally and we'll move forward," Gerrard told Rangers TV. "The reality is if you raise your arm, you leave yourself wide open. Obviously he's been provoked in the first place but it's happened on too many occasions now. "I've gone above and beyond - I've backed Alfredo more than enough and I can't defend him any more." Morelos' first red of the season, for kicking out at Scott McKenna after the Aberdeen defender had barged him, was rescinded. But the striker has been sent off twice more against Aberdeen this term, once for throwing an arm at Shinnie, and again for another kick on McKenna, who was also ordered off for his part in the incident. Morelos was dismissed too in Rangers' Europa League draw with FC Ufa after receiving a second yellow card for dissent, having already been cautioned for kicking the ball away. Celtic boss Neil Lennon denied that Brown's flicking of his opponent's leg was a pre-planned attempt to rouse the Colombian's temper. "It wasn't premeditated," Lennon said. "You'd need to ask Alfredo Morelos why he keeps doing it because he's a great player but he's obviously got major discipline problems." Rangers staged an impressive fightback from the loss of both the opening goal and Morelos inside four first-half minutes, with Ryan Kent levelling after the break. Indeed, Gerrard's men could have gone ahead when Ryan Jack fired over from close range. But after they gave away possession, James Forrest struck an 86th-minute winner. Even then, Joe Worrall came agonisingly close to equalising again but was blocked by Kristoffer Ajer, as Rangers fell 13 points behind their Scottish Premiership-leading rivals with seven games remaining. "When the dust settles, I'm sure I'll be proud of a lot of the performance but the reality is we've lost a big, important game and it's difficult to take. I think it was there for the win, never mind the draw. "It's frustrating to be standing here and it's tough to take but there was a lot to be proud of, a lot of character shown today, but you get nothing for that." I think Rangers have got to cash in on Morelos now. The boy obviously doesn't listen. If you're in the Celtic dressing room, you're saying 'noise him up get I his face and see if he reacts'. You're not telling me that Steven Gerrard has not said to him 'do not react under any circumstances'. So what do you do? Do you just keep accepting it, or do you take your money and run? What are you going to do with a boy like that? Steven Gerrard must be thinking 'I just can't fathom him out'. Rangers have had plenty of practice at this system with Morelos going off so many times.